Cranfield Impact Centre is a UK based organisation which is internationally respected in the field of vehicle crashworthiness and analysis. 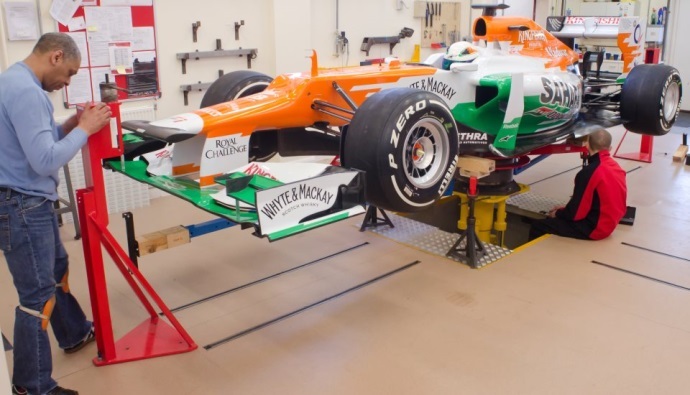 One of their key test laboratory facilities is a 3-axis moment of inertia/centre of gravity measurement platform, which can be used to test components such as transmissions, or complete vehicles including Formula One cars. Simplicity AI were tasked with completely replacing the legacy software utilizing new modular National Instruments DAQ hardware and the LabVIEW software platform. The software provides a logical intuitive user interface, whilst behind the scenes performing over 150 different calculations to generate results. By utilising a dynamically configured calculation system, Cranfield engineers are were able to adjust equations during the commissioning phase, without having to modify any LabVIEW code. The final system is massively flexible, allowing test and object parameters to be entered or modified after data has been gathered. This feature allows valuable time with a vehicle under test to be maximised, as much of the configuration can be done during the post-processing stage. All data is recorded, but statistical outliers can be removed from calculations to improve result integrity. The scalable software architecture has allowed Simplicity AI to incorporate a number of later additions to further increase the programs functionality and productivity.